There is something about April that reminds me of lemons. Maybe it’s the matching yellow from the rough skin of the fruit to what it supposed to be the sun shining in the sky. Or maybe it’s the fresh citrus smell to match the blooming tulips. It may even be the hope there will be lemonade stands in the summer heat around the corner. Although I’m not sure of the reason, I do know the reminder the sun should be coming out soon has been needed more than a couple times with this long winter extending it’s arm well into the spring months. Tia went with a solid staple in her repertoire this week. 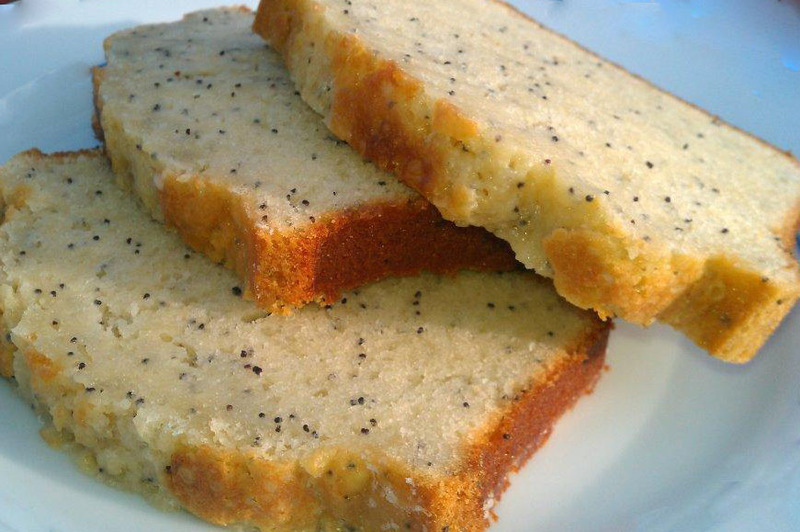 I love the combination of lemon and poppy seed. The bread has a light consistency, but a gooey crunch from the sugary glaze on the top. To say it was good would be misleading because it was downright fantastic. Hopefully you will try the recipe and enjoy a taste of spring while you are fighting off the winter blues. Trust me, if you do, you will be thanking Tia for bringing sunshine back into your life. Preheat oven to 350oF. Grease and flour 2 loaf pans. Combine sugar, oil, eggs, vanilla and lemon extracts in a large bowl; mix well. Stir in poppy seeds. Sift together flour, baking powder and salt. Add flour mixture and milk to sugar mixture alternately, mixing well after each addition. Divide batter evenly between prepared pans. Bake loaves for 45 minutes or until a toothpick inserted in center comes out clean. Loosen edges from sides of pans. Cool loaves in pans for 10 minutes. Turn out onto wire racks. For icing, blend lemon juice and confectioners’ sugar in a small bowl. Drizzle over warm loaves.